The New York Yankees seen has only been over for a week yet fans are already looking forward to the endless possibilities this winter. Harper. Machado. Corbin. Kershaw. Bumgarner. Goldschmidt. These are some of the many names that have been mentioned as potential additions to the Yankees. Here are my thoughts on the winter that lies ahead. The Yankees biggest need is starting pitching. Luis Severino, Masahiro Tanaka, and Sonny Gray are the only starting pitchers on the roster and Gray is openly being shopped. Even with a bunch highly rated prospects in Triple A, the Yankees will need to sign or re-sign at least two pitchers before next season. Offensively, we need a Left Fielder and middle infield. Preferably, one of those players would be a left handed hitter. The only “lefty” that would be in our every day lineup is switch-hitting Aaron Hicks. We can also use another bullpen arm. Even though we had the fourth lowest bullpen ERA, David Robertson and Zach Britton are free agents. We can likely only afford to bring back one and we don’t have a lot of depth after Aroldis Chapman, Dellin Betances, Chad Green, and Jonathan Holder. Our free agents include longtime Yankees like C.C Sabathia, Brett Gardner, and David Robertson, in addition to late season pickups like J.A Happ, Britton, Andrew McCutchen, Lance Lynn, and Adeinyy Hechavarria. Neil Walker is also a free agent. I think Happ should be our first priority out of all these guys. He may have left a bad taste in our mouth after giving up five runs in two innings against Boston, but we need at least two pitchers and if we can sign or trade for another, all of a sudden he could be our fourth starter. We also need to make a decision on Robertson and Britton. Britton struggled initially, but didn’t allow an earned run in the months of September. However, he let up three runs in five postseason innings. Robertson strikeout to walk ratio was much better than Britton’s. However his ERA, while over a much larger sample size, was higher. Another factor is that Britton is a lefty and Robertson is a righty. If you resign Robertson, you will have to spend money on a second reliever. I think the rest of the Yankees free agents are take them or leave them. McCutchen has the best chance to return out of the offensive free agents. He is a high on-base guy who hit 20 home runs in his time with the San Francisco Giants and the Yankees, but if we get Harper or choose to go with another lefty bat, he is gone because I can’t see him returning as a backup. Walker could also return if we strike out on Machado. As sad as it is, it’s likely that Yankee mainstays, Gardner and Sabathia are gone. I look forward to seeing C.C’s enter Monument Park 5-10 years from now. I believe that Patrick Corbin is the most likely to sign with the Yankees and will be a high priority. He finally reverted to his pre-Tommy John form with a career-low 3.15 ERA and a career-high 246 strikeouts. The Yankees had interest in Corbin last off-season and he grew up a Yankee fan in Upstate New York. If signed, Corbin will likely be the number two starter behind Luis Severino and in front of Masahiro Tanaka. Manny Machado and Bryce Harper will be the two biggest offensive free agents in years. They would make just about any of the 30 Major League teams better. I prefer Harper over Machado. First of all, he is a lefty bat. Secondly, he would fill our need in Left Field. While Machado would play Shortstop (at least until Didi Gregorius comes back). He’d likely move to third base after Didi’s return, which would take playing time away from Miguel Andujar, if Andujar is not traded. Even though he struggled on defense, Andujar is considered the favorite to win Rookie of the Year and it would be foolish to give up on him. He has plenty of time to improve defensively. There is also a chance that if we get Machado, that we just let Didi walk after next season. Are there other free agents besides Corbin, Harper, and Machado? Yes, and I believe there are several that would be great fits in New York. As I mentioned earlier, if we let Britton walk we will need another lefty out of the bullpen. I think rookie Stephen Tarpley will be good, but when you are competing with teams like Boston and Houston for the American League Pennant, you can’t put all your eggs in a rookie’s basket. Former Yankee Justin Wilson would be a nice under-the-radar signing. He had a 3.10 ERA in his only season with the Yankees. Since then, he has been a high leverage lefty in Detriot and Chicago. He even closed in 2017 for the Tigers, before being traded to the Cubs at the deadline. Since leaving the Bronx, he has struck out 214 batters in 171 2/3 innings. There are a lot of righties available for bargains if Robertson leaves as well. Some notables are Adam Ottavino, Sergio Romo, Adam Warren, and Brad Brach if we can’t hold on to Robertson. Ottavino, like Corbin, grew up a Yankee fan and established himself as a top setup man despite pitching in a hitter friendly park. Brach was an all-star a few years ago and closed when Zach Britton was hurt in Baltimore. Romo is a long-time closer who is aging. Warren was traded from the Yankees to Seattle this season. He has a career 3.18 ERA in pinstripes and can we use in long, short, or middle relief. Had the Yankees known A.J Cole was going to regress in the second half, they might not have traded him. If the Yankees do not land Corbin, Dallas Keuchel would be a good consolation prize. Not only would he strengthen our rotation, but he would weaken Houston. Keuchel has won a CY Young and has pitched in two all-star games. 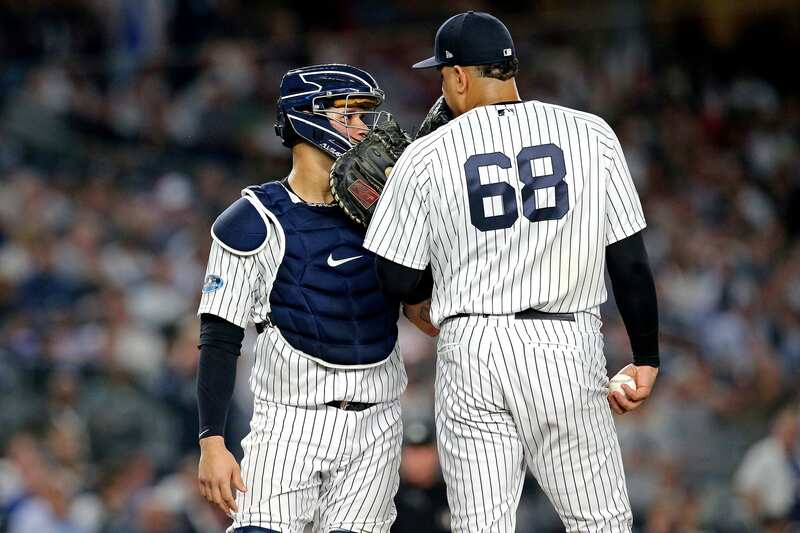 While his numbers haven’t been as great since winning the CY Young, he has a career 3.28 ERA in the postseason and he is a ground ball pitcher, which boads well in Yankee Stadium. Offensively, Outfielder, Michael Brantley, and Infielder, Daniel Murphy, are good options if we fail to land Harper or Machado. They are both lefties, and they are both high contact low strikeout players. Brantley is a career .295 hitter who has never struck out more than 80 times in a season. He is a three-time all star who has one 20-20 season to his name. His high average and speed make him a prototypical lead-off hitter. Murphy is a career .299 hitter who hasn’t hit below .280 in a season since his second year in the majors. On the Mets run to the World Series in 2015, he discovered his power stroke and established himself as a clutch hitter going 16 for 38 with seven home runs in 9 games in the first two Murphy would likely play second until Didi gets back in addition to DHing and platooning at first with Luke Voit. Brantley and Murphy do have question marks. Both guys are over 30 and have dealt with injuries at times the last few years. Murphy’s defense is also suspect. What do we do with Didi? A bomb was dropped during Aaron Boone and Brian Cashman’s exit press conferences, our starting shortstop, Didi Gregorius, needs Tommy John surgery. He is not expected back until some point in the summer. If we get Machado, he will play short until Gregorius get back. If we end up keeping Miguel Andujar, Didi might be gone after the year. If they fall short in their pursuit for Machado, they would go with a short term option at second or short. I have already mention Daniel Murphy and Neil Walker has possibilities, if we move Gleyber Torres to short. Jose Iglesias, from the Detriot Tigers, could be an option if we elect to keep Gleyber at second base. Iglesias has a low strikeout rate and has the greatest fielding percentage of all-time for a shortstop. He has a 2.1 defensive WAR over the last three seasons. Buster Olney has reported the Yankees could be interested in trading for Paul Goldschmidt. The six-time all star has quietly been one of the best all-around players in baseball the last five year, but he doesn’t get the attention he deserves because he plays in a small market and only made two playoff appearances in his career. His contract expires after the year and the Diamondbacks appear to be ready for a fire sale. He has three Gold Gloves, once stole 32 bases, and led the league in walks in 2016. He is a career .297 hitter with a .398 on-base percentage who averages 31 home runs and 105 RBI’s per 162 games in his career. A package for Goldschmidt would start with Luke Voit and additional prospects. Goldschmidt while elite, however is probably a low priority. There is also a chance we can acquire a pitcher like Madison Bumgarner or Zack Greinke in a trade this winter. If we sign Machado, there is a chance Miguel Andujar would become our biggest trade chip. I do not like the idea because as I mentioned earlier, I think he can still become a good defensive third basemen with some work. Other than Andujar, Clint Frazier, Estevan Florial, and our many pitching prospects could be used as trade bait. Madison Bumgarner has established himself as not only an ace, but a clutch postseason performer. He has three World Series rings and a 2.11 career playoff ERA. While it may seem like a no-brainer, Bumgarner should come with a warning label. From 2013-2016, he had 2.86 ERA, a 1.014 WHIP, and struck out 9.4 batters per nine innings. He averaged 216 innings a year and if he add his postseason numbers, he pitched 930 and 2/3 innings. In the last two seasons, he has a 3.29 ERA, 1.172 WHIP, and has only struck out 7.9 batters per nine innings. He also missed time due to injuries only pitching 240 and 2/3 innings the last two years. While he is still a very good pitcher, this could be a sign that he is started to breakdown. If we could get a relative discount, I would do it in a heartbeat since he is a free agent after next season. However, giving up Andujar might be a little too much. Greinke still has $104.5 million and three years left on his deal. Many have suggested that we can get Greinke by offering the Diamondbacks Jacoby Ellsbury and prospects. Taking Ellsbury would save the Diamondbacks $57.3 million over the next three years. There is a chance that his contract will also be really bad by the end. There are also doubts about whether or not Greinke, who was treated for an anxiety disorder in 2006 can handle the pressure of New York. How do we get rid of dead weight? I gave an example above of how we can get rid of Jacoby Ellsbury. We would have to find a team with a larger and/or longer contract that another team wants to get rid of. The Yankees were rumored to be in talks with the Orioles last winter but there is no way that is happening given the Orioles lost 115 games and started a youth movement. Another possibility would be trading him to the Giants for Brandon Belt. Belt is considered expendable because the Giants might move Buster Posey to First Base full-time in the near future as a result of a major hip injury that ended his season early. The Yankees would save themselves $4.1 million each of the next to season, but would have an additional $12 million on their payroll for the 2021 season. Belt might be a decent fit because his career on-base percentage is 90 points high than his batting average. He can also play First Base, Left Field, or DH. He is however an injury risk because he has only played 150 games twice in his career. If no trade partner is found and Ellsbury is healthy, we might have no choice but to keep him as a backup. Brian Cashman has already acknowledged that Sonny Gray is on the block. He reportedly had seven offers on the table at the deadline. Gray is one of the biggest trade busts in recent memory. He had a 4.51 ERA in a season and a half with the Yankees, including a 5.26 ERA has a starter this season. Playing in Oakland the first four and a half year of his career, he had a 3.42 ERA and a 1.200 WHIP, both of which are skewed by an injury-plagued, disappointing, 2016 season. The consensus seems to be that he cannot handle the pressure of New York. He had a whopping 6.98 ERA at home compared to a respectable 3.17 ERA on the road this year. One team that sticks out as a possible landing spot is the Milwaukee Brewers. They have an elite bullpen and a high-powered offense. However, they do not have a true ace. If they blow their 2-1 lead to the Dodgers, or lose in the World Series, they might take a chance on Gray, who has one more year of team control. The Yankees need to replenish their farm system, particularly on offense. 21 of their Top 30 prospects are pitchers. The Brewers are particularly deep in the outfield where the Yankees are thin. Christian Yelich and Lorenzo Cain have made Domingo Santana, who hit 30 home runs in 2017, and Keon Broxton, a strong fielder who had a 20-20 season in 2017, expendable. In addition to Santana and Broxton, they have prospects like Corey Ray, Trent Stokes, Trent Grisham, and Weston Wilson likely coming up to Triple A. If the Brewers are interested in Gray, we could trade for Broxton, Santana, or one of the prospects to compete with Clint Frazier for the fourth outfield spot and stick the loser of the battle in Triple A. This would prevent a Shane Robinson situation in the event of an injury. Greg Bird is a complicated case. In the days of three man bench, most teams do not carry a backup that only plays on position like Bird does. They also have Ryan McBroom, the Scranton Rail Riders Player of the Year, in Triple A who can play first, and could add a guy like Murphy or bring back Walker to back up/platoon with Voit if he gets injured or drops back to earth. Unfortunately for the Yankees, Bird’s value is at an all-time low so they might not be able to get something good for him. I think he will start the season in Triple A. The Yankees have a wealth of pitching prospects of those 21 prospects on the Top 30 list I referenced earlier, 11 of them have pitch at least one game in Double A. That doesn’t include Domingo German, who is no longer considered a rookie, and Stephen Tarpley. I think Tarpley will be in the bullpen with Chapman, Betances, Robertson/bargain righty, Britton/Wilson, Green, and Holder. I think Domingo German will get a chance to compete with Luis Cessa and AJ Cole to be the second multi-inning reliever out of the pen. German struggled as a starter this year, but his stuff is too good to give up on him. He may be better suited for a bullpen role. In 31.2 career innings as a reliever, he has a 3.13 ERA compared to the ghastly 6.19 ERA he has as a starter in 14 career starts. I can see the Yankees holding a competition for fifth starter amongst their kids if they only land two pitchers. Justus Sheffield, Chance Adams, and Jonathan Loaisaga all made their major league debuts this year and while they all pitched out of the pen at points, they are seen as starters long-term. Eric Swanson and Michael King are two guys that MLB.com ranks in the Yankees top 30. Swanson, who we acquired from the Rangers in the Carlos Beltran trade, dominated Double A with a 0.42 ERA before being promoted to Scranton. He struggled out of the gate at Scranton and injured his groin, but pitched better after coming off the DL. Michael King is another guy who could get a long look in Spring Training. He was acquired from the Marlins along with international bonus money as well as Caleb Smith and Garrett Cooper for the purposes of opening up 40 man roster spots and chasing Shohei Ohtani. We did not get Ohtani, but King rose from the Tampa Yankees in A ball, to Trenton in Double AA, and finally all the way to Triple AAA. He had a combined 1.79 ERA, .091 WHIP, and held batters to .202. He also struck out 152 batters in 161.1 innings and had the luxury of being caught by Gary Sanchez while the star Catcher was on a rehab assignment. It may seem like a risky proposition starting a rookie but you have to remember, their only the fifth starter. In theory, you have more of a chance finding an ace in your farm system then on the market because their simply aren’t a lot of aces on the market. It would also give the Yankees a chance to see what they have before making a trade. There is also a chance Jordan Montgomery returns from Tommy John before the end of the season, but I would not get my hopes up.